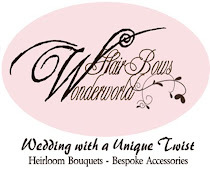 hairbowswonderworld: It's time for blog giveaway! The other day I made this cute clip for a lady in a board I am in and I thought it'll make a nice blog giveaway, too. 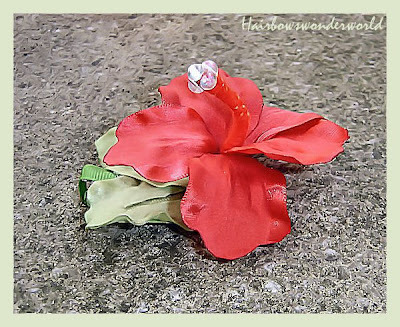 If you win you can choose either the clip itself or the instructions on how to make this ribbon hibiscus flower. And a giveaway on a monthly basis would be nice wouldn't it? Here is how we'll do it. What you need to do is just visiting my blog and give a comment (1 entry). I'll let my six month old choose the winner from all entries and post the pic of the process here. Lovely hair clip and great giveaway! Whoever wins this is super lucky to have a genuine "Hairbowswonderworld Lynn flower!" You are truly and artist!!! I've twittered and Facedbook for you! But you don't need to enter me, I already own a gorgeous rose! I want someone else to experience your work! I want that fabulous bow! Your bridal bouquet is my fave. of course this flower is wonderful! its the state flower of Hawaii! whoot! WOW...thats all i have to sat about that. You do beautiful work. I looked at all of your items on Etsy and I am blown away. I would love to be entered in your contest. Last time I was at the library I was looking at a book on creating flowers with ribbon and I was marveling at all of the work that is put into them. You do a fantastic job!!! I love this flower!! You do awesome work! You are just so talented!! Everything you do is beautiful!! I just had to add you to my web site!! Here is the link!! GHB, your erbsite looks great. Thank you so much for featuring me there! 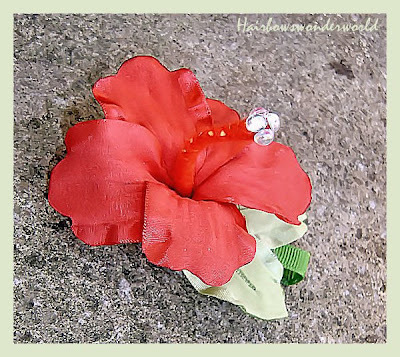 I have been looking for a flowered hair clip, and this one is fantastic! Love it, love it, love it. The red color is amazing. Thanks for this great contest! Ohhhhh my goodness, this is my favorite flower. I am new at this and due to illness in bed alot and I have sat here and looked at your items over and over! Absolutely beautiful! I don't know what profile to select as I dont know what that means. I hope this goes thru. This beautiful hibiscus reminds me of Hilo, Hawaii, where there was a large hibiscus bush of this color outside my door! This flower art is just so gracious and charming, Mahalo (thanks) for the memories! That's very pretty! I love red, and the sparkle accents. Thank you for the great giveaway. The clip is beautiful! WOW i loveeeeeeeeee everything on your blog~! I love lvoe love your blog~! Love your hibiscus! You have a lovely shop and are so talented! One of my faves is the Lilly Brooch or hair clip -CREAM! Thanks for the giveaway. The Hibiscus flower is gorgeous! Excellent giveaway! Your shop is great. I love the Mint Chocolate Stacked Hair Bows! Beautiful!! Thank you for the chance to win. Checked out your shop and I love the Holiday Special Handmade Grosgrain Ribbon Rose Hair clip.